For other people named Bill Terry, see Bill Terry (disambiguation). William Harold "Bill" Terry (October 30, 1898 – January 9, 1989) was a Major League Baseball first baseman and manager. Considered one of the greatest players of all time, Terry was inducted into the Baseball Hall of Fame in 1954. In 1999, he ranked number 59 on The Sporting News list of the 100 Greatest Baseball Players, and was a nominee for the Major League Baseball All-Century Team. The Giants retired Terry's uniform number 3 in 1984; it is posted on the facade of the upper deck in the left field corner of AT&T Park. Nicknamed "Memphis Bill", he is most remembered for being the last National League player to hit .400, a feat he accomplished by batting .401 in 1930. Born in Atlanta, Terry made his professional baseball debut in 1915 at the age of 16. He began his career as a pitcher, playing for two separate minor league teams, the Newnan Cowetas of the Georgia–Alabama League and the Dothan club of the FLAG League. With Newnan, he managed an impressive win-loss record of 7–1, with a microscopic 0.60 earned run average (ERA) in eight games. After starting 1916 with Newnan, by the end of the year he had moved up to the class-B Shreveport Gassers of the Texas League. He again compiled impressive statistics for his new team, putting up a record of 6–2 with a 1.07 ERA in 11 games with Shreveport. Terry spent all of 1917 with Shreveport, with a record of 14–11 and an ERA of exactly 3.00. By this time, he was also beginning to play more in the field, pitching in 40 games and appearing in 55 other games. After spending several years playing semi-professionally, Terry was picked up by the Toledo Mud Hens of the American Association in 1922. He was now playing in double-A, the highest minor league level of the era. While he was still pitching some, putting up a 9–9 record in 26 games, his hitting was also starting to pick up. In 88 games with Toledo, Terry batted .336 with 14 home runs. In 1923, Terry had been converted into a full-time first baseman. In 109 games with Toledo that year, Terry batted .377 with 15 home runs. This gained the notice of the major league New York Giants, and on September 18 they purchased his contract from the Mud Hens. In an interesting coincidence, Freddie Lindstrom, another future Hall of Fame player, was also purchased by the Giants from the Mud Hens on the same day. Terry made his major league debut with the Giants on September 24, 1923 in a game against the Cincinnati Reds. In that game, he pinch-hit for Giants pitcher Rosy Ryan, going 0-for-1. Terry didn't play again until September 30, when he made his first appearance in the starting lineup against the Boston Braves. Terry got his first major league hit in that game, going 1-for-3 and scoring his first major league run. Terry finished the season with one hit in seven at bats in three games. Terry played all of 1924 with the Giants, backing up fellow future Hall of Famer George Kelly at first base for the pennant-winning team. Terry played in 77 games, 35 at first base and the rest as a pinch-hitter. He batted .239 with 5 home runs and 24 runs batted in (RBI). In the World Series against the Washington Senators, he batted .429, including a Game 1 home run off Walter Johnson. In 1925, Giants starting third baseman Heinie Groh suffered an injury early in the season, forcing the team to juggle its lineup a bit. 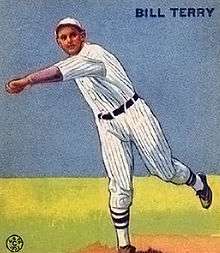 Starting second baseman Frankie Frisch was tried at third, but wound up spending most of the season shifting around the infield when Lindstrom was made the starter. Kelly was moved from first base to second, and Terry was installed as the starting first baseman. He hit .319 in 133 games, with 11 homers and 70 RBI. In 1926, with Lindstrom now established as the starter at third, Frisch was reinstated at second and Kelly moved back to first, sending Terry back into a reserve role. In addition to backing up Kelly, Terry played in 14 games in the outfield. This was the only season in which he played more than one game at a position other than first base. Overall, Terry played 98 games, batting .289 with 5 home runs and 43 RBI. During the following offseason, the Giants made some major changes to their starting lineup. On December 20, 1926, they traded Frisch and pitcher Jimmy Ring to the St. Louis Cardinals for Rogers Hornsby. Then, on February 9, they traded Kelly to the Reds for outfielder Edd Roush, opening a spot once more for Terry in the starting lineup. Terry batted .326 in 1927, with 20 home runs and 121 RBI. He finished 13th in the voting for the National League MVP, and his days of being a backup were behind him for good. Over the next two seasons, Terry continued to produce for the Giants, batting .326 again in 1928 with 101 RBI, and then .372 in 1929 with 117 RBI. In both years, he finished in the top ten in the NL in a number of statistical categories and in 1929 he finished 3rd in the MVP voting. All of this led to what is generally considered Terry's best season ever, 1930. In 1930, Terry had an historic season. He finished first in the National League with a .401 batting average, the first player to hit over .400 since Rogers Hornsby in 1925. It is also the last time to date that anyone in the National League has hit .400. Only Ted Williams of the American League's Boston Red Sox in 1941 has hit .400 since. Terry also led the league with 254 hits, which is tied for the most in NL history with the Phillies' Lefty O'Doul's 254 in 1929. He also finished 5th in the league in on-base percentage (.452), 7th in slugging percentage (.619), 6th in runs scored with 139 runs, and led the league in putouts and assists by a first baseman. While there was no official league MVP award in 1930, Terry won The Sporting News NL MVP. While Terry never again reached the lofty heights of 1930, he had another excellent season in 1931. He led the league in runs scored with 121 and in triples with 20 while batting .349 with 112 RBI, and he finished third in the new BBWAA NL MVP voting. He became the only Giants player (as of 2014) to hit two doubles and two triples in a game when he did so against the Cincinnati Reds on September 13, 1931. In 1932, Terry set his career high in home runs with 28, batting .350 with 117 RBI. 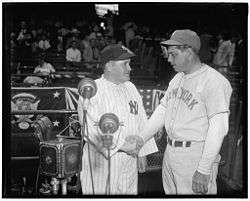 He was also named the team's manager in early June, replacing the legendary John McGraw. The team finished in sixth place. In 1933, Terry's first full season as manager, the team won the National League pennant and the World Series. Although, as a player, Terry missed a month early in the season with an injury, he still hit .322. It was also the first season of the All-Star Game, for which Terry was chosen as a starter and in which he got two hits. The Giants once again faced the Senators in the 1933 World Series, which they won four games to one. Terry went 6-for-22, hitting a home run in Game 4 off Monte Weaver. Despite an off-year, Terry still finished fourth in the MVP voting, perhaps gaining votes for managing the team to the championship, the Giants' first since 1922, the year before Terry's MLB debut. In 1934 Terry came back to put up big numbers once more, finishing second in the NL in batting at .354 and in hits with 213 while finishing seventh in the MVP voting. Terry managed the team to a second-place finish, just two games behind the pennant-winning St. Louis Cardinals "Gashouse Gang". In 1935, Terry again got over 200 hits with 203, and batted .341 while finishing sixth in the MVP voting, and managed the team to a third-place finish. In both years he was again selected to start in the All-Star game. As manager, Terry became an advocate of platooning, as Hank Leiber and Jimmy Ripple split playing time in center field. 1936 was Terry's last year as a player. Before the season started, the team had purchased Sam Leslie from the Brooklyn Dodgers, and Terry the manager split time with the newcomer, with Leslie getting the lion's share. It worked out well for the team, as they again won the pennant, beating the Cardinals by five games. In the World Series, Terry started all six games, but batted just .240 with no extra base hits. He did have five RBI, but it wasn't enough, as the Giants lost to the New York Yankees, four games to two. Terry continued to manage the Giants until 1941. He also held the title of general manager of the Giants from September 7, 1937, through the end of the 1942 season. The Giants won another pennant in 1937, but they lost another World Series to the New York Yankees, four games to one. The team finished third in 1938, but never again finished in the first division under Terry, finishing fifth, sixth, and fifth in his last three years as manager. After retiring from playing and managing, Terry settled in Jacksonville, Florida, where he owned an automobile dealership. He purchased the Jacksonville Braves double-A team in 1958. Over his 14-year career, Terry posted seven seasons with 100 or more runs, six seasons with 100 or more RBI, six seasons with at least 200 hits, and nine consecutive seasons batting .320 or higher, from 1927 through 1935. He also showed some pop, posting three seasons with at least 20 home runs, including a career high of 28 in 1932. Terry retired with 1120 runs scored, 154 home runs, 1078 RBI and a .341 batting average. He also currently holds the record for the highest career batting average for a left-handed hitter in the National League at .341. Terry was also one of the best fielding first baseman of his era, compiling a career .992 fielding percentage. Bill Terry's number 3 was retired by the San Francisco Giants in 1984. Terry was inducted into the Baseball Hall of Fame in 1954. In 1999, he ranked number 59 on The Sporting News' list of the 100 Greatest Baseball Players, and was a nominee for the Major League Baseball All-Century Team. The Giants retired Terry's uniform no. 3 in 1984; it is posted on the facade of the upper deck in the left field corner of AT&T Park. ↑ "Batting Game Finder: From 1914 to 2014, Playing for SFG, (requiring 2B>=2 and 3B>=2, sorted by most recent date), sorted by name". Baseball-Reference.com. Retrieved May 4, 2014.